The Forest Service launched its “Foothills Landscape Initiative” in the fall of 2016. 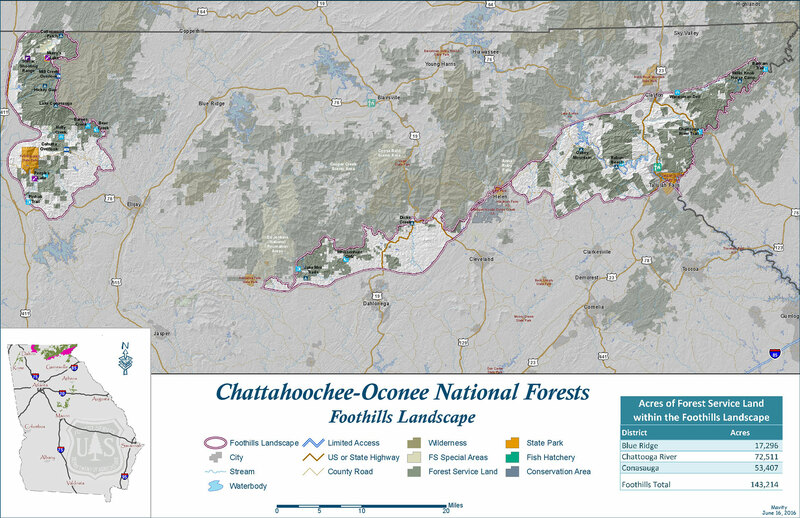 The project area encompasses a vast 143,419 acres of national forest land in north Georgia, including a significant portion of the Chattooga River watershed in Rabun County. The Forest Service is seeking public input to consider as they develop specific aspects of the project. Currently, we’re engaged in the Foothills Project’s “collaborative” process to push for the restoration of native forest types, old-growth forests and native canebrake ecosystems, and to also push for the protection of water quality, wilderness areas and roadless landscapes within the project area. After a series of public meetings and workshops during 2017, the Forest Service recently issued its “proposed action” for the Foothills Project. The agency has also developed an online forum to solicit public participation. To read the Forest Service’s documents and join the online forum, please visit their website. This is a very large project, and as it develops, please check for future updates.